. SVN Rock Advisors stays in the know for our clients. We are Multifamily Specialists in Brokerage, Feasibility Studies, Purpose Built Apartment Development Consulting, Asset Management, Lease-ups & Value Creation. The following article speaks to the high demand for purpose built rentals and the type of amenities today’s renters demand. In the last five years, housing options for renters in Toronto have been bleak. You could rent an apartment in an old high-rise, a floor in a chopped-up Victorian house or a unit in a condominium, where at any moment you might face eviction if the owner decides they want to move in. However for the first time in decades, there’s been an uptick in private developers constructing a range of new purpose-built rental projects, which housing advocates say is crucial to fixing Toronto’s city’s housing crisis. 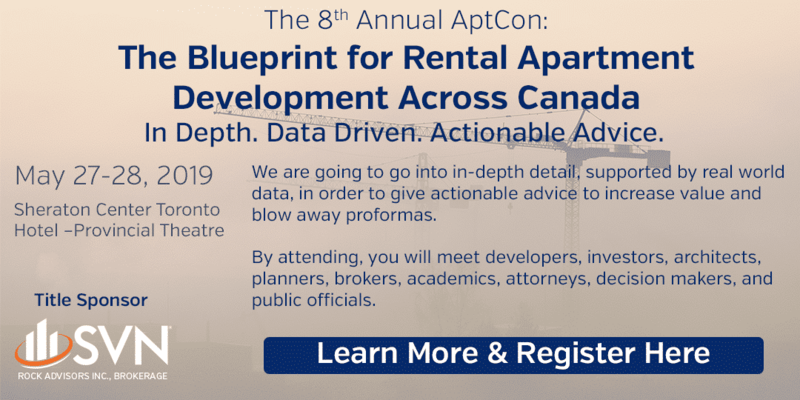 In a study published last year by the Ryerson City Building Institute and Evergreen, a non-profit focused on sustainable urban planning, around 8,000 new purpose-built rental units need to be constructed each year to keep up with the city’s housing market. According to data from real estate analysts Urbanation Inc., 2,669 purpose-built rental units across nine projects will be built by the end of the year. In comparison, over the last decade, the purpose-built rental market has only grown by 2,400 units. Unlike traditional apartment buildings, this new crop of purpose-built rental projects is ripe with high-end amenities typically found in sleek condos: gym facilities, yoga rooms, movie theatres, party rooms, dog parks, 24/7 concierge desks and rooftop gardens. Generally, these types of luxury rentals cater to baby boomers looking to downsize from single family homes, young professionals priced out of home ownership or people who want condo amenities but don’t want to commit to buying a unit. SVN Rock Advisors Apartment Crane Watch gives readers the latest information about current and proposed apartment projects. 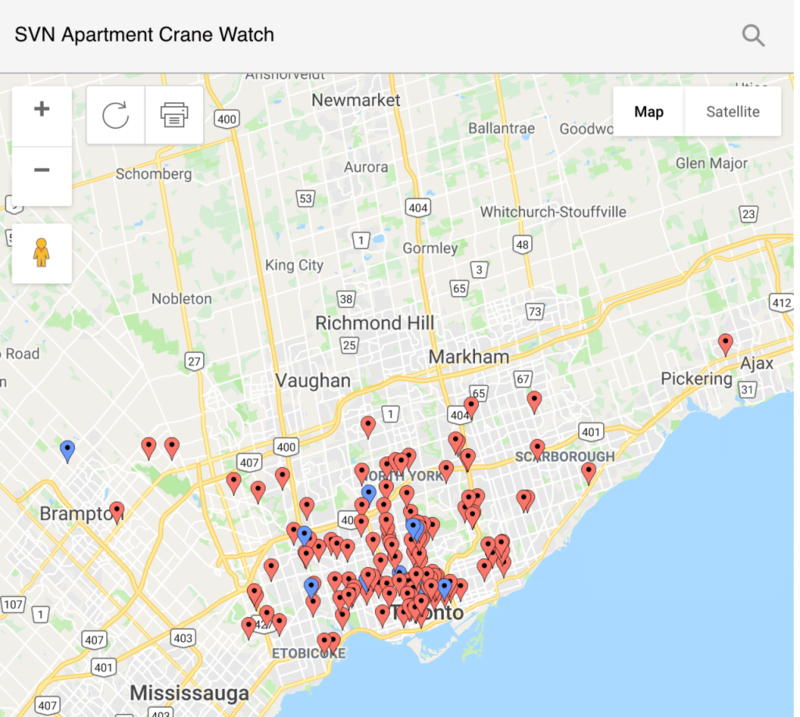 The Apartment Crane Watch, is a map with details of major apartment construction projects currently underway in Toronto. Our next Crane Watch includes all of Ontario, with other markets in Canada to follow.